The Ugandan team made history in Williamsport, Pa., when it became the first African team to win a game in the World Series. The Ugandans beat a team from Oregon in a consolation game last Tuesday. Uganda coach Henry Odong called that win a “great accomplishment.” On Wednesday, he said the team’s trip to Yankee Stadium was the opportunity of a lifetime. “We never expected it,” Odong said. The team toured the clubhouse and hung out on the field during batting practice, chatting with players and getting autographs. Earlier in the week, Team Japan took the same tour of the Stadium.”This was a great opportunity,” Odong said. 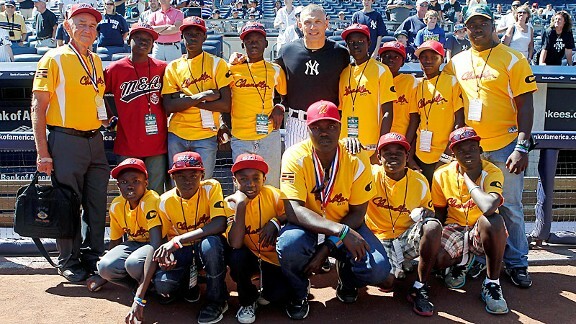 Some Ugandan players hadn’t heard of Derek Jeter, Alex Rodriguez or Robinson Cano prior to their day at the Stadium. One asked a reporter which player had signed his ball. Of course, it’s understandable that some of the players wouldn’t be familiar with the Yankees. I would love to know whats going on now with little league baseball in Uganda and elsewhere in Africa. It seems like after last year when the Uganda team made it to Williamsport for the little league World Series I haven’t been able to find anything else about them and how and if baseball is progressing. I would love an update on the Uganda team!! If anyone knows anything give a shout out!! Thankyou! !